Editor's note: This article was updated March 21, 2014. Dock Green Silverhawk blew softly on the bits of tobacco held in the curl of his fingers and then raised his arm. With an open hand, he released a sacred offering to his Creator. "I'm giving my very breath, my life force to my Father," said Silverhawk, who is the spiritual leader for the American Indian Christian Circle of Thonotosassa. The congregation meets on the second and fourth Sundays in the fellowship hall of Thonotosassa UMC in Hillsborough County. On a table lay several items, including Silverhawk’s flute, from which moments earlier the gentle sounds of "Amazing Grace" floated into the air. A bowl of white sage and a hawk's feather also lay there. The sage was lit and passed among the 20 or so worshipers who sat in folding chairs in a circle. They waved their hands through the rising smoke, pulling it toward them in an act of spiritual cleansing and preparation for prayer. Then the feather was passed around, as individuals either silently prayed or spoke out loud to the group. 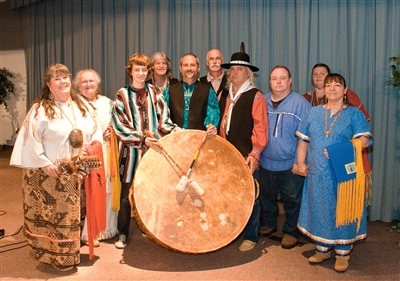 The Sacred Thunder Drum group rhythmically beat out songs in praise of God, singing in a native language and English. Worshipers danced around the drum, offering up their prayers. The circle is one of two in Florida that give Native Americans the opportunity for Christian worship that honors their spiritual and cultural heritage. The second is the American Indian Christian Circle of Lake County. A third circle is emerging in Crawfordsville, south of Tallahassee. 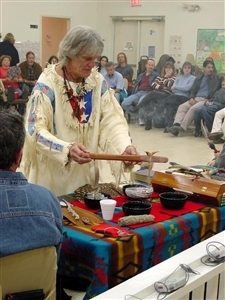 On April 11-13, Silverhawk, who is of Creek and Cherokee descent, will serve as unofficial "master of ceremonies" for the Ninth Annual Native American Ministries Gathering at the Life Enrichment Center (LEC) near Leesburg. The gathering brings together Christian Native Americans from Florida and other states, including Georgia, North Carolina and South Carolina. The event is sponsored by the Florida Conference and its Committee on Native American Ministries (CONAM), along with the circles of Thonotosassa and Lake County. Guest speakers will be Cheryl Bear-Barnetson and her husband, Randy Barnetson, who are evangelists of First Nations of Canada. The couple have ministered in 600 of 1,000 native communities in the U.S. and Canada. Bear-Barnetson of the First Nation Nadleh Whut 'En is an award-winning singer, songwriter and storyteller. The Sacred Thunder Drum group of Thonotosassa helps bring awareness to the cultural heritage of Native Americans in Christian worship. Photos from Vickie Swartz. Traditional artist, cultural presenter and historian Pedro Zepeda of the Seminole Tribe of Florida also is a guest speaker. This year's theme is "Christianity from a First Nations Worldview." Everyone – native and non-native – is welcome. Registration is free but due by March 26. Participants’ costs include lodging or campground use and meal packages. The weekend will be devoted to fellowship, native culture and raising awareness of the church's Native American ministries. In the past decade, Methodists have been pro-active in reaching out to Native Americans in a way that seeks to redress past historical misdeeds, including an 1864 massacre of more than 160 Cheyenne and Arapaho led by a Methodist minister. CONAM was founded in 2005. Every Florida United Methodist congregation is encouraged to appoint a representative to serve as liaison to the committee, and once a year, churches are asked to observe a Native American Ministries Sunday. A portion of the proceeds from the special Sunday offering benefits CONAM, including the annual gathering. At the 2012 General Conference, Methodists adopted an Act of Repentance and formally asked for God's forgiveness for mistreatment of Native Americans. "Methodists always had some outreach to Native Americans," said Vickie Swartz, coordinator for the annual gathering and CONAM's chairperson. "They haven't always done it in a good way. They were doing it the way everyone did." That meant forcing Native Americans to adopt white European lifestyles. "They were basically stripped of who they were," said Swartz, who is of Cherokee descent. However, through the annual gathering and worship circles, natives are receiving "fresh experiences of Christ within their culture," she said. "They are not expected to conform to something that is not their culture." 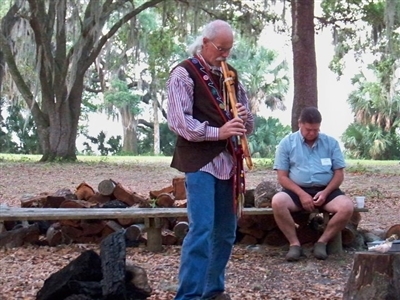 Ed Taylor, vice chairperson of the Florida Conference Committee on Native American Ministries, plays the flute at a recent gathering. She maintains there is still work to do, however. Swartz estimated that about 50 churches in the Florida Conference observe the annual special Sunday and many churches do not have Native American Ministries representatives. "There will be people in almost every congregation that have some Native American heritage, and if that interests them ... they should come see us," said Ed Taylor, CONAM’S vice chairperson, adding that worship circle visitors are welcome. He leads services every third Sunday at the fellowship hall of Mascotte UMC in Lake County. The annual gathering at the LEC sustains native culture but more importantly provides an opportunity for Native Americans of all tribes to share their love of Christ and encourage the formation of more worship circles, said Taylor, who traces his heritage to the Miami tribe. Swartz and her husband, Jeff, are members of Sacred Thunder Drum and participate in a Sunday ministry at various non-religious pow wows. They later became friends with Silverhawk, organizer of the annual Silverhawk Native American Flute Gathering at Withlacoochee River Park near Dade City and also the host of monthly meetings of the Native American Flute Circle at Plant City’s Bruton Memorial Library. The Thonotosassa worship circle is believed to be the first in the state. Cherokee, Delaware, Mohawk, Apache, Miami and Creek are among the tribes represented there, and worshipers come from Wesley Chapel, Zephyrhills, Thonotosassa, Lakeland, Plant City, Auburndale and Brooksville. The Swartzes drive from Sarasota for services, and Taylor travels from Clermont. "We have people who come here who would never go to a white church," Silverhawk said. "Distrust is still there." But he sees the Methodist outreach as unique. "They are the ones that gave us the opportunity to start a circle. I have a great love of Methodists."